With nearly a 29-year track record that has produced hundreds of educated and enthusiastic divers. Learning to dive with The Scuba Company ensures a lifetime of knowledge and support. 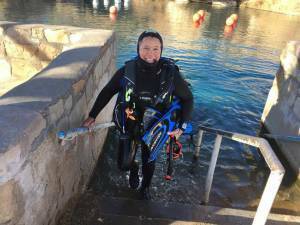 Join Albuquerque’s most trusted resource for learning to dive and beyond. The Scuba Company has certified thousands of divers of all ages, from basic Open Water Certification through professional instructor training. Our instructors are avid divers with a wide range of experience around the globe and they are committed to your safety and enjoyment in the water. We encourage our instructors to travel around the world to gain valuable experiences to bring back and share with you, bringing a higher level of both excitement and knowledge to our company. Maintaining very strict instructor-to-student ratios helps The Scuba Company provide the highest level of safety possible. A Dive Master or two are provided to assist instructors and students. By providing the extra set of hands, the learning environment is both safer and more efficient. We also have an extensive set of policies implemented to PADI standards to compliment our instructor’s personal commitment to safety. Only the best gear will be provided to students. Aqua Lung is the industry leader in scuba gear, and we utilize their top-of-the-line dive gear to guarantee student comfort. Breathing is the most important part of scuba diving, and the Aqua Lung Legend regulator provides an incredibly seamless breathing experience. Additional dive equipment also includes very modern Buoyancy Control Devices (BCDs), comfortable wetsuits and dive computers. Our course fee includes the learning materials, instructor and pool fees, gear rental and the official certification card. The only items outside of this fee are personal gear (mask, snorkel, fins, and boots), the Santa Rosa dive permit and any transportation/ accommodations. So breathe easy… we are with you every step of the way!